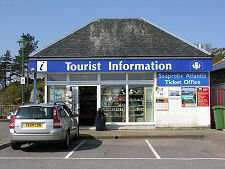 Most visitors coming to Kyle of Lochalsh do so en route to or from Skye. 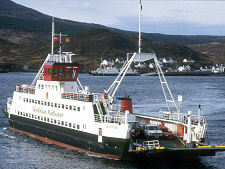 Until 1995 the Skye ferries left from the slipway by the Lochalsh Hotel. Vehicles embarking here were carried across Kyle Akin (the strip of water separating Skye from the mainland) to the slipway opposite at Kyleakin. 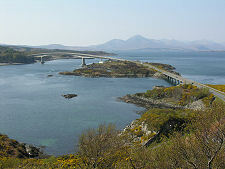 That all changed with the opening of the Skye Bridge. The bridge brought many changes to Kyle. No longer do visitors have to put up with the ferry queues stretching back down the A87 in busy periods. And the building of a new road from the centre of Kyle to the bridge has opened up parts of the town that were previously largely inaccessible. Kyle is older than it looks and it is likely that there was a settlement here before 1600. In 1819 the road from Inverness arrived, via Lochcarron and a ferry across Loch Carron to Stromeferry before coming through Plockton. 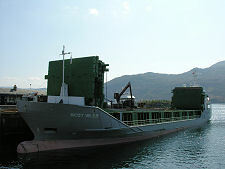 Kyle then rapidly became the main ferry terminus for Skye. And from 1897 when the Highland Railway from Inverness reached Kyle the town took over from Stromeferry the role of mainland terminus for the steamers to Stornoway as well. It was only the advent of the roll-on roll-off era in 1973 that saw the Stornoway ferries start to use the shorter crossing from Ullapool. Those who drive through Kyle en route to the bridge miss a town that has made itself an increasingly attractive place since the disappearance of the ferries. 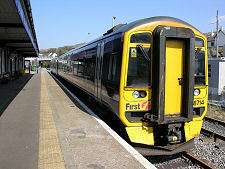 The focus is the shoreline, which stretches as far as the research institute in the east, beyond the pier carrying the railway station and its regular services to and from Inverness and sometimes beyond. 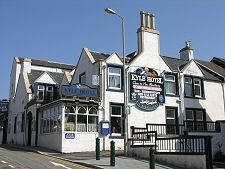 The railway station is home to a seafood restaurant and to the excellent Kyle Line Museum. 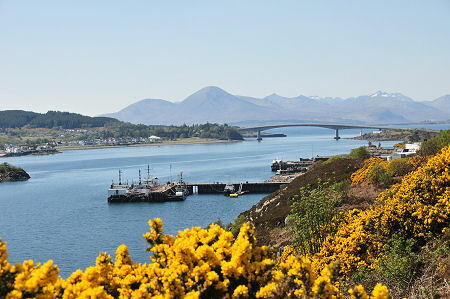 Kyle also boasts a busy harbour that plays host to a variety of cargo, fishing and occasional passenger vessels; and a neat set of moorings that sit in front of the Lochalsh Hotel and the slipway once used by the ferries. 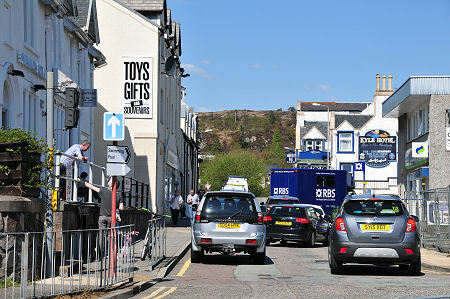 Further back still is the main commercial centre of Kyle: an attractive collection of largely whitewashed buildings. These offer a range of shops, including small supermarkets, a couple of banks with cash machines, and at least one fish-and-chip shop. 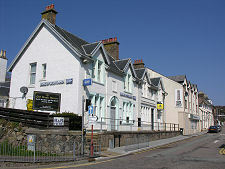 A more recent addition is the larger supermarket that has opened above and behind the Lochalsh Hotel. 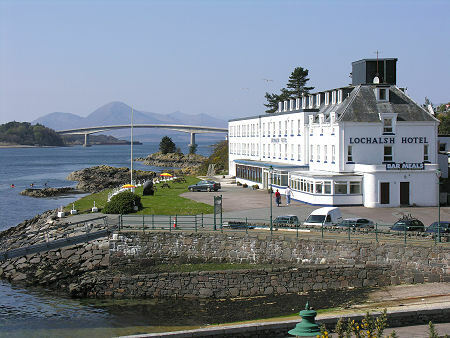 We've mentioned the Lochalsh Hotel a couple of times already on this page, and it is without doubt the most striking landmark in Kyle of Lochalsh, offering superb views and a range of accommodation. But as you'd expect in somewhere the size of Kyle, there is also a choice of other accommodation on offer to suit a variety of tastes and budgets. Kyle has succeeded in turning itself from a place where people waited for a ferry into somewhere worth visiting in its own right. It can still be very busy in the height of the season, but the changes since the ferries left - except for the actual absence of the ferries themselves - have almost all been changes for the better.